An increasing number of voters in the United States base their presidential decision on one or two significant issues. Those voters who choose to vote based on environmental and energy policy will have a difficult time separating the two candidates, but they may have even more trouble determining where Republican challenger Mitt Romney stands on many issues, from climate change to energy. More importantly, the energy and manufacturing companies dependent on tax credits and subsidies are left wondering which Romney, if elected, will be entering the White House, while banks and investment firms will have trouble finding enough information on which to base their investment decisions. Both Romney and Obama have advocated for a reduction in foreign oil imports and for an expansion of U.S. energy production as a mechanism for boosting the economy and creating new jobs. While both candidates agree that increasing energy independence is critical to national security, they differ significantly on the role of government in regulating and subsidizing energy, as well as which energy sectors should be targeted. Pillar 1: Romney’s Plan proposes empowering states to oversee the development and production of all forms of energy on federal lands within their borders. The plan stipulates that all state activity will satisfy requirements of federal law and be certified by Federal agencies. The plan also encourages the formation of a State Energy Development Council to share expertise and leverage best practices from other states and existing organizations, perhaps a remnant of his Bain days. Pillar 2: Romney’s energy policy paper proposes a “5-year offshore leasing plan to aggressively open new areas for development,” including minimum production targets for each lease and a mandatory annual progress reports to Congress. To further encourage offshore development, Romney proposes implementing state-of-the-art processes and safeguards for offshore drilling that support production rather than block exploration, as he suggests Obama’s policies have. Pillar 3: Romney has proposed the pursuit of a North American Energy Partnership that will replace OPEC imports with “a stable supply from secure sources at discounted price.” Romney’s plan starts with approving the Keystone XL pipeline and establishing a regional agreement for encouraging cross-border energy investment, infrastructure investment, and sales. To this end, the he proposes instituting a fast-track regulatory approval process for cross-border pipelines and other infrastructure. Pillar 4: Romney’s fourth energy agenda item is to ensure accurate assessment of energy resources by immediately approving permits for offshore seismic surveys and explorations, and leveraging Department of the Interior onshore geological and geophysical information. Collaboration with Canada and Mexico would ensure inventories of remaining North American resources, which will (hopefully) validate the feasibility of Romney’s goal of North American energy independence by 2020. Pillar 5: Romney’s fifth agenda item is regulatory reform, which has been a constant theme throughout this campaign. Romney proposes measured reforms of environmental statutes and regulations while preserving jobs and industrial growth and maintaining the use of coal. To restore transparency and prevent agencies from using “sue-and-settle” techniques to circumvent the public rule-making process, Romney proposes an update to environmental review processes and mandatory disclosure of federal funds spent reimbursing groups for lawsuits against the government. Pillar 6: Finally, Romney proposes to facilitate innovation in the energy industry through investment in research across the full spectrum of energy-related technologies, maintaining the Renewable Fuel Standards (RFS) and eliminating regulatory barriers to diversification of the electrical grid, fuel system, and vehicle fleet. Romney’s plan emphasizes a “level playing field” that will open access the land for oil, gas, coal, wind, solar and hydropower facility development. Specifically, Romney’s plan proposes revitalizing nuclear power through encouragement of new reactor designs and ending the wind Production Tax Credit (PTC). The rational for this added layer of bureaucracy is that states are more time efficient in processing and permitting for exploration and drilling. However, the proposed methodology relies on the Federal government to develop new criteria for the states, which the states will follow when developing individual permitting and processing programs, which return to the Federal government for approval. Romney’s current campaign rhetoric and stated policy is both pro-nuclear and pro-coal, stating that EPA’s proposed Carbon Pollution Standard ensures that “a coal power plant will never be built again in the United States,” and accusing the Obama administration of “waging war on the entire coal industry” with “excessive regulations that could drive up energy prices while destroying millions of jobs.” However, in 2005, as Governor of Massachusetts, Romney announced plans to limit CO2 emissions from the state’s six largest and oldest power plants and supported regulation of non-greenhouse gas air pollutants to protect public health. The question for investors and the energy industry is which Romney, if elected, will enter the White House — the Romney that understands CO2 ­­and other air pollutants must be regulated to protect public health or the Romney that believes such restrictions will doom the coal industry, and therefore the economy? The reality is that no investor will be making any decisions before the election, regardless of polling or likely outcome. Even if Romney is elected president, banks and investors are highly unlikely to invest in coal plants, which are relatively expensive to build and incur on-going costs for up to 50 years after construction. Construction time alone is an average of four years, by which time a new president, with different priorities, could take office. Additionally, the fate of most other energy sources is still unclear, particularly wind energy, whose tax credits Romney has pledged to eliminate upon entering office. With this in mind, where will Siemens plan to put its next wind turbine manufacturing plant, and the jobs that go with it? Probably not the US. As for the oil and gas industry, it remains to be seen whether Romney’s added layer of state regulations will speed up the permitting process as intended, or create large up-front delays as each state scrambles to develop and implement a new permitting process once the Federal government develops a new set of state-specific guidelines. There may yet be further delays for oil and gas companies who do not meet the new state guidelines. 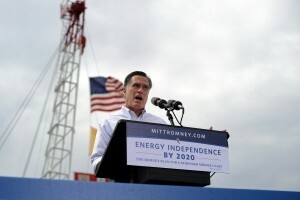 Romney claims his energy policy, if implemented will result in three million new jobs, $1 trillion in new revenue, and “immediate economic growth” from lease payments and royalties. However, his policies do not incentivize the construction of renewable energy plants in the United States, nor are they likely to stem the slow decline of the coal industry. His regulatory policies appear to put more restrictions and obstacles in the way of the permitting process, lengthening the time it will take for oil and gas companies to realize profits that will feed into Federal and state revenues. Voters will need more than Romney’s vague energy policy paper to determine how his jobs and revenue goals can be accomplished – and it’s up to Romney to state his case more clearly in the days leading up to the election. Adrienne Lalle is an energy professional with experience in manufacturing, research and consulting. She graduated from the University of Virginia with a degree in Chemical Engineering and Biotechnology. Adrienne lives and works in the Greater Washington Area.